Contents are divided into an Introduction and the three sections of the book’s title, with helpful appendices: Tidal Streams; a section on local rock names and the Breton language; and Waypoints. 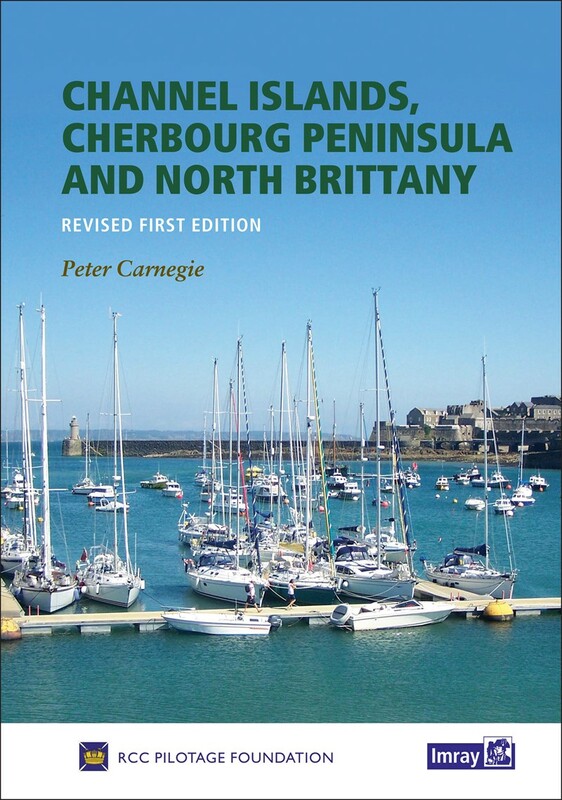 The Channel Islands section starts with “getting there”, a useful English Channel crossing guide. Navigating around the islands is simplified by chartlets of local island tides found in the appendix; these help to unravel the mystery of the rotational tidal system of this gulf, enabling the reader to ride the magic roundabout of powerful streams in a favourable direction. All the sections contain an historical note, with hints on museums and sites to further whet the appetite. This makes it much more readable than some of the rather dry and purely navigational predecessors, which needed to be supplemented with a chatty book. The clarity of the harbour approach information and chartlets, together with the annotated photographs with bearing lines, some of them aerial, is excellent. Returning to the index, the list of rock names and their description is a special feature, you are encouraged to think of rocks as friends, once identified they are pointers, unlike those shifting sands. Similarly, waypoints listed in the index are related by bearing and distance to their nearest identifiable feature, encouraging the navigator to look up from his screen and use the Mark 1 eyeball. Combining this book with good charts and electronic aids, will encourage more sailors to cruise these nearby but more challenging waters. To test the book I checked the pages on a couple of tricky anchorages which I have visited, Les Ecréhous and the Ile de Molène, in both cases they are more comprehensively covered and I would have explored Les Ecréhous further with this book aboard. Visiting the Minkies (Plateau des Minquiers) and Iles Chausey is thoroughly covered. Taking this to the extreme, there is even a section on landing on the bleak and forsaken Roches Douvres. Peter Carnegie, his team of helpers, the RCC Pilotage Foundation and the experienced publishers at Imray are to be congratulated on producing a guide which combines practical instruction, clear visual guidance, and a lively and readable text. All the necessary information is to hand for that next enjoyable cruise. Below is a link to Imray's website. RCC Members can benefit from a discount by ordering through the Imray link in the Members' Area.